With parents getting ready for their kids to head back to school soon, I wanted to share how I make a healthy school lunch that my children love. It didn’t take long for me to figure out that my children weren’t the least bit excited for cafeteria lunches and that I needed to make them lunches for school. The thought of making three lunches every day of the week terrified me at first, but we quickly learned how to make it work for all of us. They got a healthy school lunch they enjoyed, and I felt good about the food they were eating. The key for us was communication. I had to let them know my guidelines for the items that could be included in their lunch and they had to share their concerns about “healthy foods.” They originally had in their minds that I was going to send them to school with a lunchbox full of broccoli. I can see why there was some trepidation there. But through a simple conversation we were able to express ourselves equally and find our way to a common goal – healthy school lunches! Since we’re on the topic of conversation, I have to tell you about Mardi Gras Napkins conversation starters. 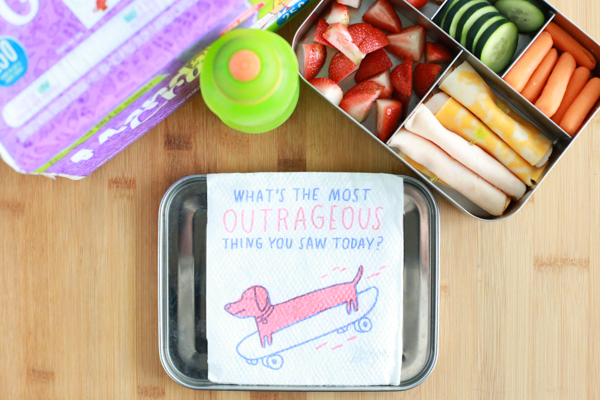 I absolutely love these little napkins and they’re a perfect addition to school lunches. They make a great way to start conversation. 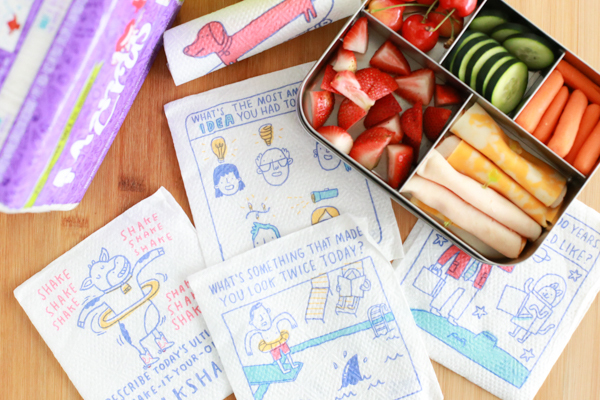 Whether it’s teaching your children to start conversations with others, or having a conversation at home, these napkins ignite spontaneous and unexpected conversations with super-cool illustrated prints featuring clever conversation starters. This will depend on your children and their preferences. For us, a healthy school lunch includes each of the food groups with a variety of bright and colorful options. My kids don’t all like the same foods, so each of their lunches look different. To find out what a healthy school lunch looks like to them, have them make a master list of all the healthy foods that they enjoy. Their list will probably include some non-healthy foods, but this is a great time to teach why those foods aren’t healthy. 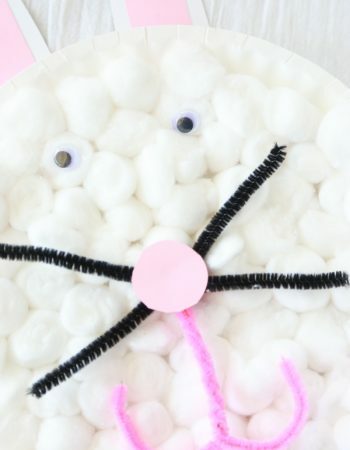 Don’t necessarily mark those items off the list for good, they make a fun addition when it comes to a surprise day. Then, at the beginning of each week, have them create their own menu with the foods they would like to see in their lunch that week from their master list. 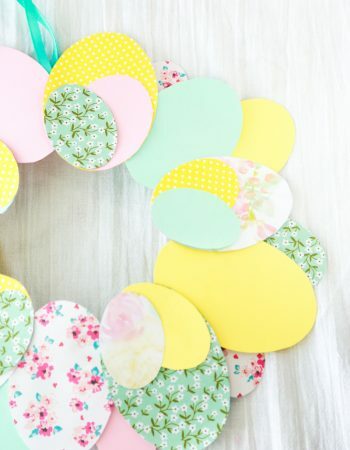 This can be done on index cards, sticky notes, or whatever you have laying around the house. Not only does it take some effort off your workload, it gives them the ability to decide what they want to eat for the week. Remember that a healthy school lunch is not the time to experiment to see if your child will eat something. They need fuel to make it through the rest of their school day, so fill their lunches with healthy foods that you know they already enjoy. What Should I Put in a Healthy School Lunch? Fruits. When it comes to fruits I use their list plus look for which items are in season and on sale. Most of the time I try to include two different fruits in varying colors but sometimes it doesn’t work out that way. If only one fruit from their list is on sale or in season, I’ll give them them a double portion of that fruit. Vegetables. I’ll be honest and tell you that vegetables are harder than fruits to get in a healthy school lunch. Although my children have been raised eating vegetables, they would rather bypass vegetables at lunch. But I insist and make sure I include only vegetables that they enjoy. I’ve also found that cutting them into smaller pieces or even into shapes help. A small container of ranch dressing helps, too. If your children are anything like mine, you’ll need to stick with the list regardless if the vegetable is on sale or in season. Protein. 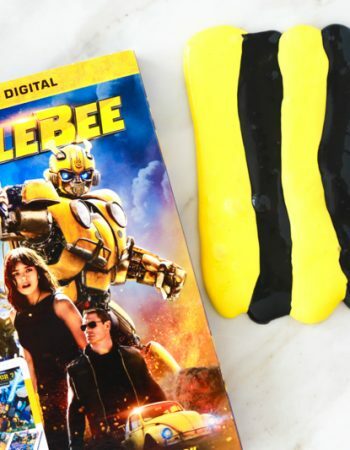 Each week we switch things up so that my kids don’t get tired of the same thing. Some of their favorites are meat & cheese roll-ups, nut butter sandwiches, tortilla roll-ups, etc. If your children don’t like sandwiches, hard boiled eggs are another great option. Dairy. Depending on their preference for the week, I’ll either include yogurt or cheese. Water. I always pack water. This is the one area where they don’t have a choice. Lunchbox with multiple compartments. I have three different types of lunchboxes and by far, my favorite is the one pictured. It’s a stainless steel box with five compartments. It’s totally worth the investment. 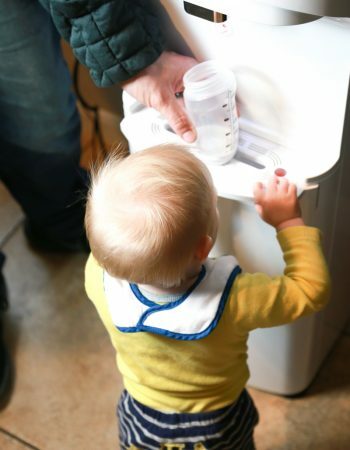 It keeps the food separated and is the perfect way to practice portion control. Reusable water bottle. Like I mentioned above, I only ever pack water for my children. It’s important to get a water bottle that is easy to use, doesn’t leak, and fits inside their bag. Small ice pack. I include a small ice pack into each of their lunches to keep their food and drink cool. Every day when they get home from school they place it into the freezer so that it’s ready for me to pack the next morning. Napkins. Eating is messy work and they’ll need a way to clean their hands. 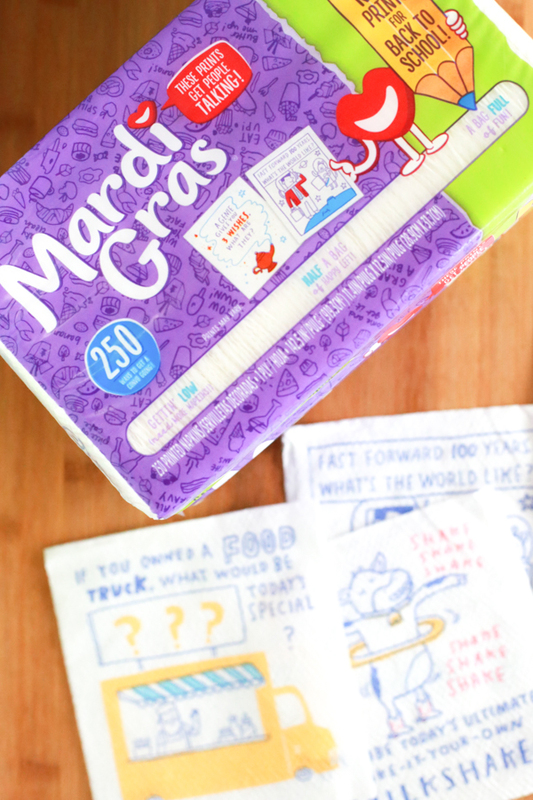 To brighten your child’s day include Mardi Gras Napkins’ conversation starters. They make for a great way to spark conversation and keep it going in the lunchroom. Insulated lunch bag. I’ve found that the best bags are the ones that offer a lot of space. I like the bags that are deep and have the handle on top. This keeps the lunch box flat so that there aren’t any accidental spills. When you and your children work together the possibilities are endless. If you want to start making a healthy school lunch for your children, spend some time together this summer making that master list I mentioned earlier. This is also a great time to have them try brand new foods. Make it fun and you might be surprised at what they’ll try. 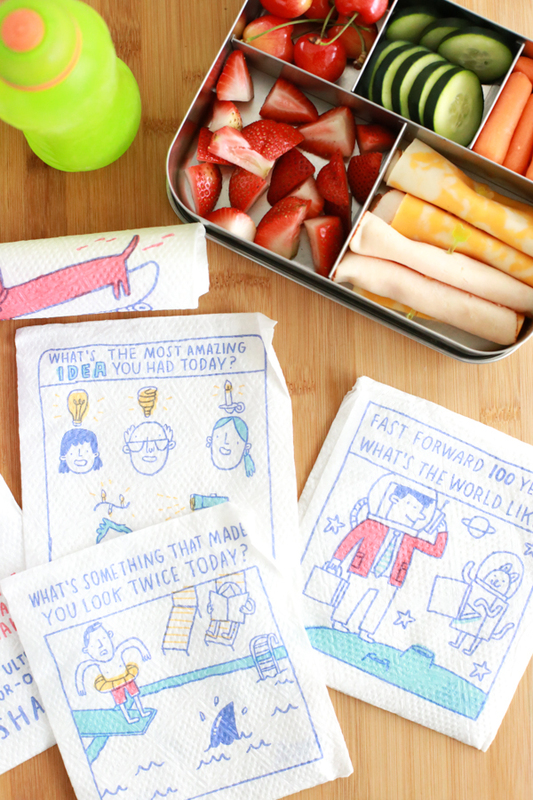 Start the new school year off right and get your child’s lunchbox ready for back-to-school with these clever conversation starter napkins for the cafeteria. 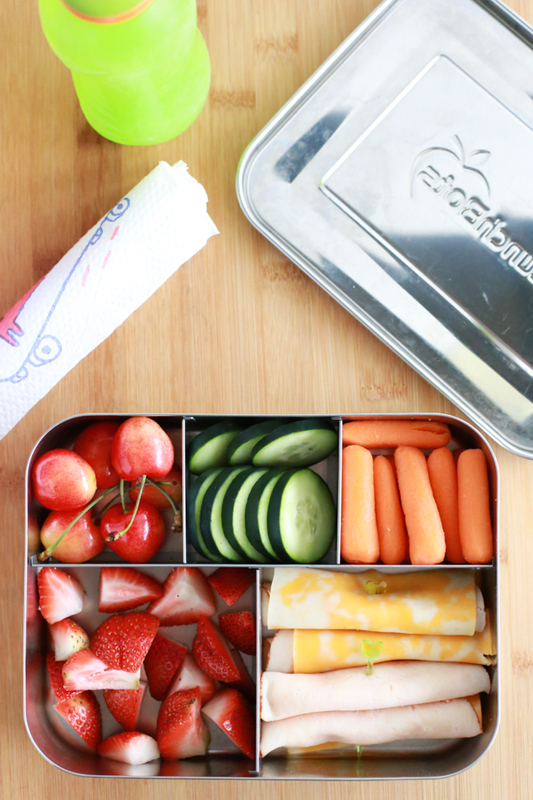 Love all of your back to school lunch tips. 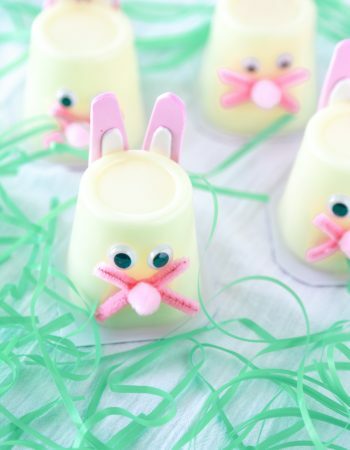 They are definitely great ideas to use to keep school lunches fun and healthy. We’re so lucky that our school has a salad bar. Both of my girls are pretty good about picking stuff off of it! 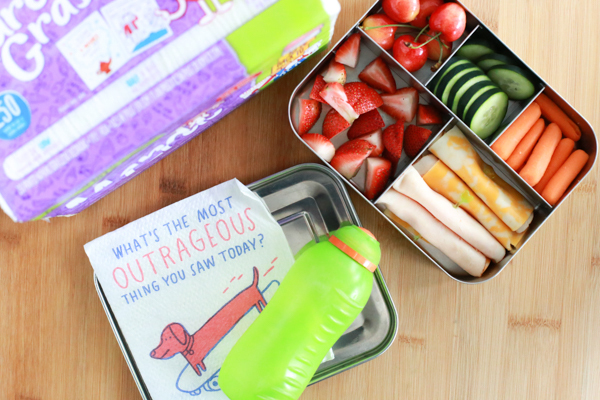 Those napkins are a cute addition to a school lunch. My kids make their own lunches but we have rules about having a certain amount of healthy foods and such. I need to get those metal lunchboxes you show here, those would be better. When my kids were in school, they always loved taking my lunches I made for them. I would make special homemade treats that everyone wanted 🙂 I love the addition of the napkins. The lunches look delicious!